So I should drop my money on this shirt?! You bet you should drop you money on this here shirt! For starters, this shirt is madly stylish and cool!! Besides being wickedly stylish, this shirt is made of great materials. The resolution of a computer or telephone display screen really does not do justice to either the quality of the fabric or buttons for this design. The buttons used here are sourced from a German company that specializes in buttons for sewing art projects. The buttons used here are a bit more expensive than those found on most dress shirts, and every color variation of our All Occasions dress shirts has a different style of buttons. This shirt is also made out of 100% Kona cotton fabric. Kona cotton is a patented and trade- marked cotton fabric originally aimed at the quilting market. Kona cotton fabric is made by first selecting a premium grade of cotton fiber then spinning this cotton into a fabric with a high thread count and exceptionally tight weave. The high thread count and tight weave make Kona cotton textiles stronger and more durable than cotton fabrics of the same weight. Garments made of Kona cotton will look better and last longer. Kona cotton is also made with attention to the issue of dye safety. Kona cotton is colored with dye that is as non-toxic and non-allergenic as possible. Kona cotton is approved for use in bedding for babies. Cheap dyes commonly used to color fabrics forming low end clothing sold at big box stores leach lead, cadmium and other toxins into the skin of people wearing these garments. Kona cotton is a wonderful thing for those with allergies or notably sensitive skin. Textiles colored by toxic dyes eventually add to the bulk in landfills, thus leaching toxins into ground water and eventually the entire local ecosystem. My cost of wholesale fabric per shirt is about the same as the cost of a button up men’s shirt at the big discount brick and mortar clothing retailers. What can I say; ultimately you get what you pay for. Quality items cost a bit more. In addition to being made of better materials this shirt is also sewn together in the USA. Quantum Cat Designs is still committed to keeping production in the USA and supporting American industry and providing jobs for Americans. Yes, it costs more to make clothing in America; no good deed goes unpunished. Although America could still be considered a wealthy country, there are still a lot of Americans struggling financially who would appreciate your support. Style Points: Mess with the hornet you get stung!!! This shirt is bold in design and concept. I thought the name Hornet’s Nest would be appropriate given the color scheme of yellow and black. The yellow is bold and colorful but not overpowering. This shirt is still suitable for office work and outings. 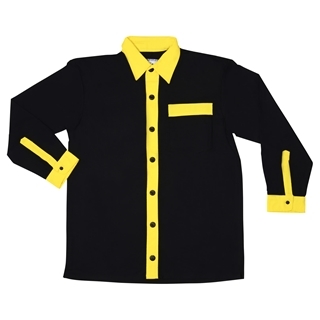 The bold yellow color makes for a zesty yet tasteful twist of individuality for any wardrobe.